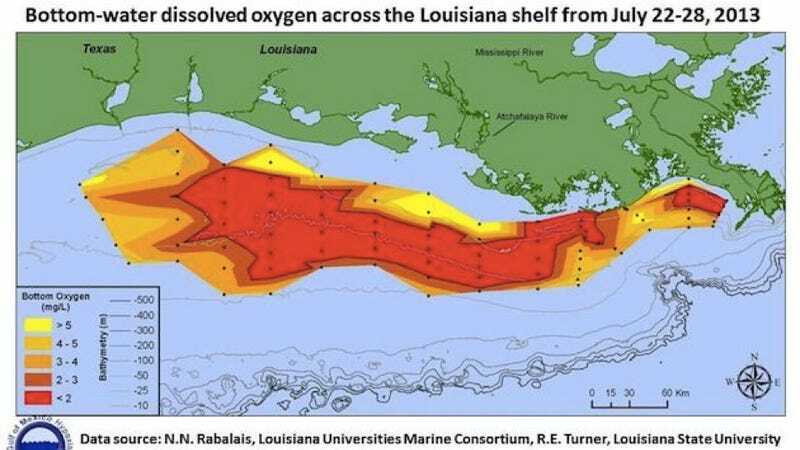 Every year, a massive "dead zone" develops in the Gulf of Mexico — a region where algae destroys almost all the oxygen in the ocean. No fish or other life forms can survive there. This year's dead zone is roughly 5,840 square miles (see above map). It's almost twice as big as last year's. What causes this watery death trap? It's something of a misnomer to call this area a "dead zone" since it's teeming with algae and bacteria. The problem is that these life forms drain the ocean of its most precious resource for fish: oxygen. Though fish live underwater, they breathe oxygen just like we do. They filter it out of the water using their gills. And when bacteria gobble up all the oxygen, or algae fill the ocean with carbon, it leaves behind an anoxic region — a vast area without any oxygen for fish to breathe. Basically, any fish in the area will suffocate. What's causing all this anoxia? Unfortunately, it's something that we all need: farms. As Tom Philpott explains in a great article in Mother Jones, the dead zone is the direct result of soil and nutrient runoff from farms in the midwest. Most of these farms are located in the Great Basin, a low-lying area that was once itself an ocean. When rains sweep through the region, the water that's not absorbed flows into the Gulf, bringing with it all the fertilizers and other chemicals used in factory farms. You can see the distinct runoff patterns in the map below. There's almost a funnel effect, with all that runoff getting concentrated in one area of the Gulf and spreading out from there. Nothing loves nutrient runoff more than bacteria. They swarm to eat up all the chemicals and metals that rain has washed away from farms across the US — much in the same way they swarmed to eat a lot of the oil released in in the Deepwater Horizon disaster. Except with farm runoff, the problem recurs every year. A 2012 Iowa State University studyfound that by simply adding one or two crops to the Midwest's typical corn-soy crop rotation, farmers would reduce their synthetic nitrogen fertilizer needs by 80 percent, while staying just as productive. And instead of leaving fields bare over winter, they could plant them with cover crops—a practice that, according to the US Department of Agriculture, "greatly reduces soil erosion and runoff" (among many other ecological benefits)—meaning cleaner streams, rivers, and ultimately, lakes, bays, and gulfs. Moreover, when animals are rotated briskly through pastures—and not crammed into factory-like structures where their manure accumulates into a dramatic waste problem—they, too, can contribute to healthy soil that traps nutrients, protecting waterways from runoff. More diverse crops and a few changes to our ranching practices could be reducing that giant dead zone.